Here is a profitable and inexpensive way to keep current on college-level, scholarly issues. If you are a student at any level, or have such a person in your home, you can request free membership in the Institute and receive two publications at no charge. 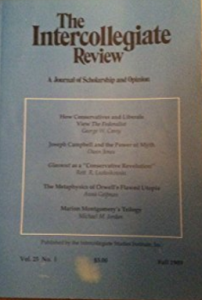 One, The Intercollegiate Review, is published 2-4 times during the academic year and is a series of articles from a Christian, or at least a Conservative, point of view. You can also receive Campus magazine which is geared to students who face these issues. Of course, I cannot endorse or even agree with some things that are written, but I have enjoyed these writers (almost always university professors). I have interacted with an article in the latest issue of the Review in this month’s Aletheia.